‘Fruit Hill Farm’ was founded in 1988 as a commercial organic market garden growing soft fruit and vegetables. Location and crops inspired the name ‘Fruit Hill Farm’. It was one of few certified organic holdings in West Cork. 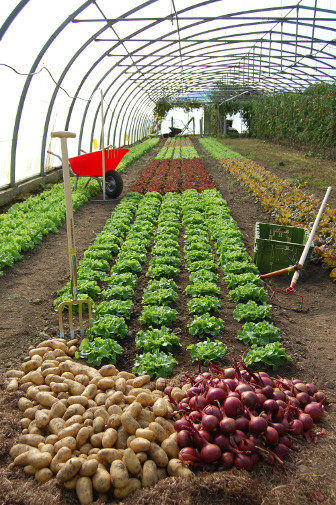 At that time ‘organic’ was a new direction for agri-/horticulture in Ireland. The difficulty of obtaining organic input materials led us to the idea of supplying the growing number of organic growers, farmers and gardeners all over the country with organic fertilizers, seeds and tools. In 1994 Fruit Hill Farm (trading) opened its office and published the first Mail Order Catalogue. 21 years later - 2015 - Fruit Hill Farm moved to new premises close to Bantry town and incorporated the business under the name Veyranno Ltd t/a Fruit Hill Farm. It was and is Fruit Hill Farm policy to support and advise ‘start-ups’ – whether they be hobby gardeners, school or community gardens or new producers who want to grow produce for sale. Our knowledge for such support comes from the day to day running of the Fruit Hill Farm market garden with over 700m2 greenhouses plus outside areas. This garden has supplied certified organic produce to the local markets for the last 20 odd years. The holding is also the testing ground for new products from hand tools to machinery, from fertilizers to seeds. Only when they have passed the test of practicality and durability can items be included in our product range. Please note we also have agents around the country - please ring them frirst to see if they have what you are looking for in stock.